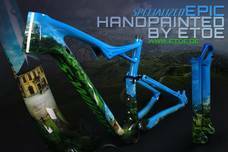 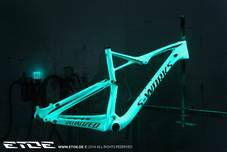 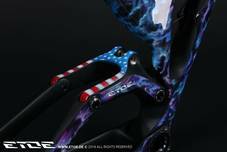 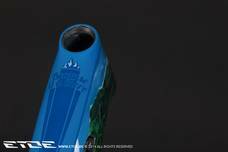 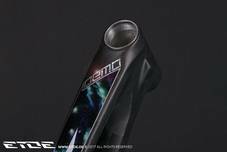 The Specialized Demo 8 is painted in Troy Brosnans space theme. 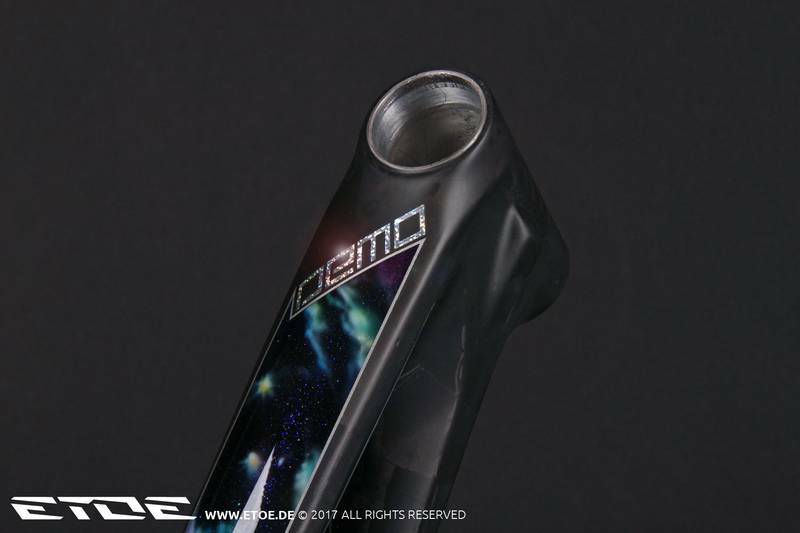 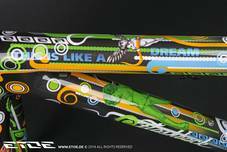 The design consists of glossy space theme layers and matt carbon areas with flakes and holographic logos. 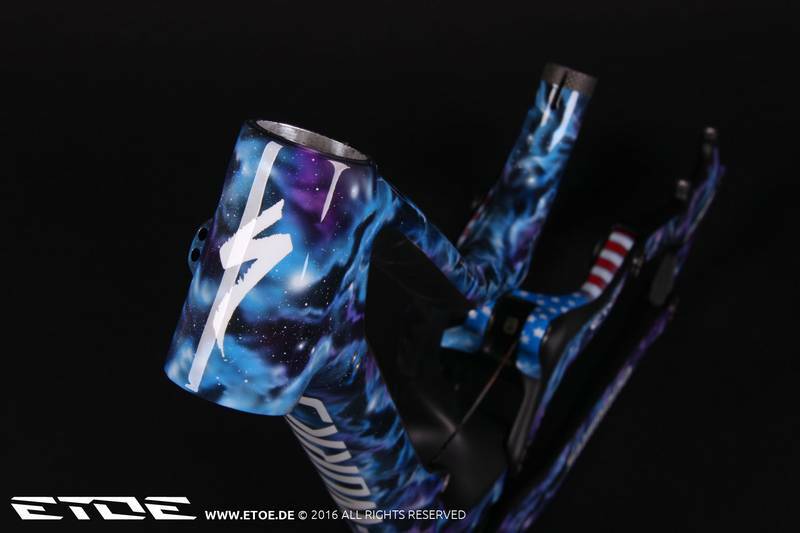 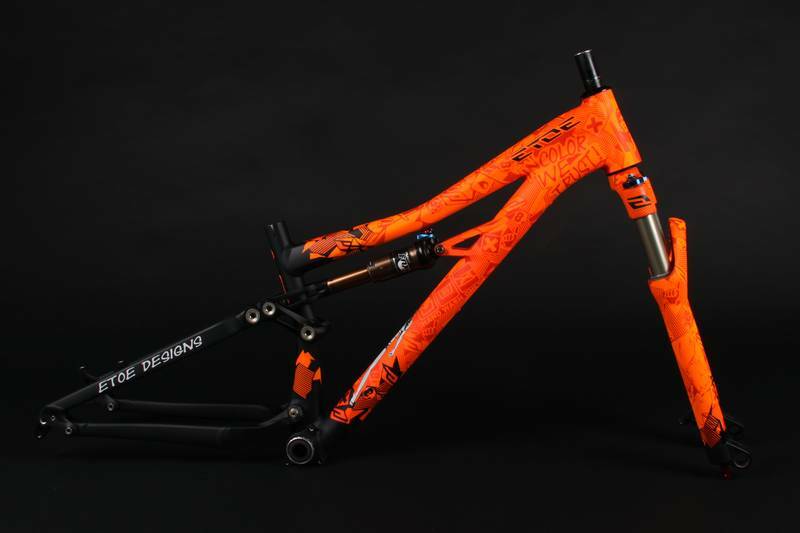 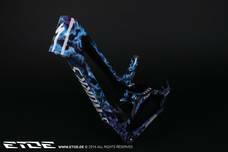 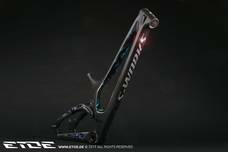 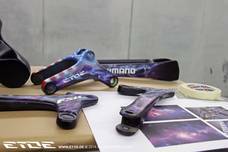 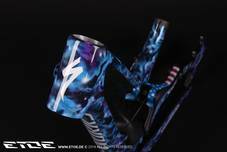 The Specialized Demo 8 is painted in Ken Blocks space theme. The design consists of glossy space theme layers and matt black areas with Stars and Stripes on the rocker. 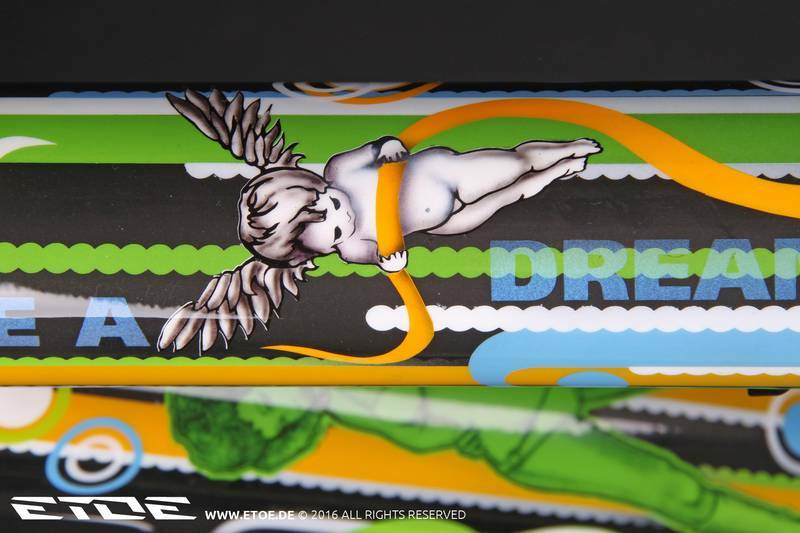 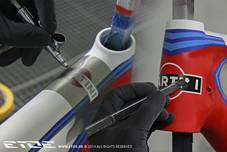 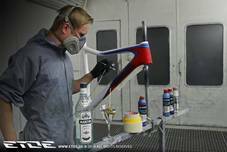 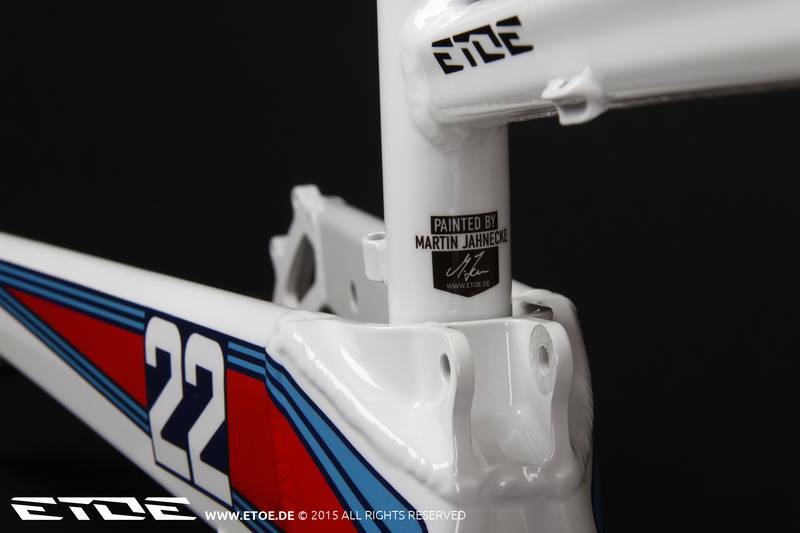 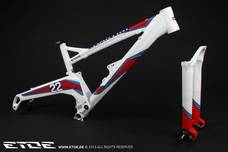 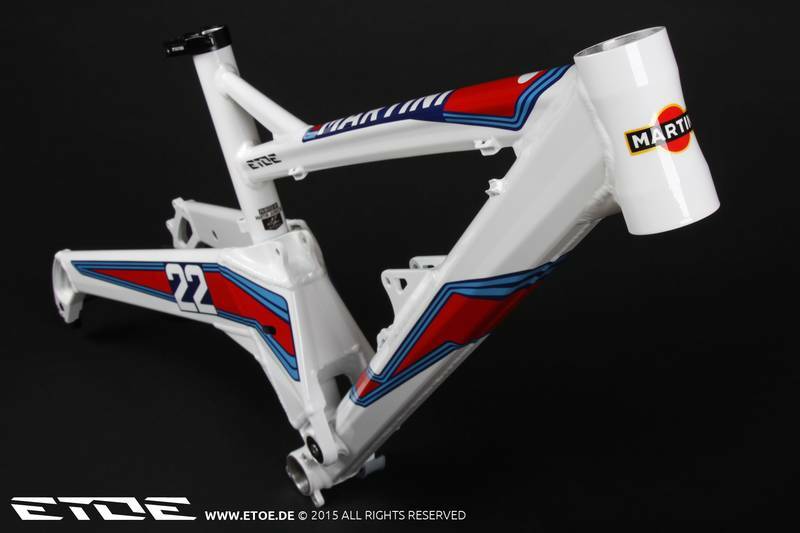 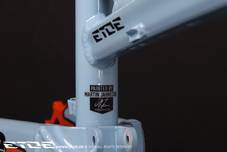 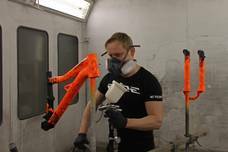 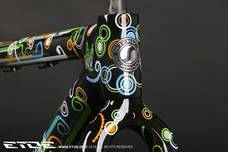 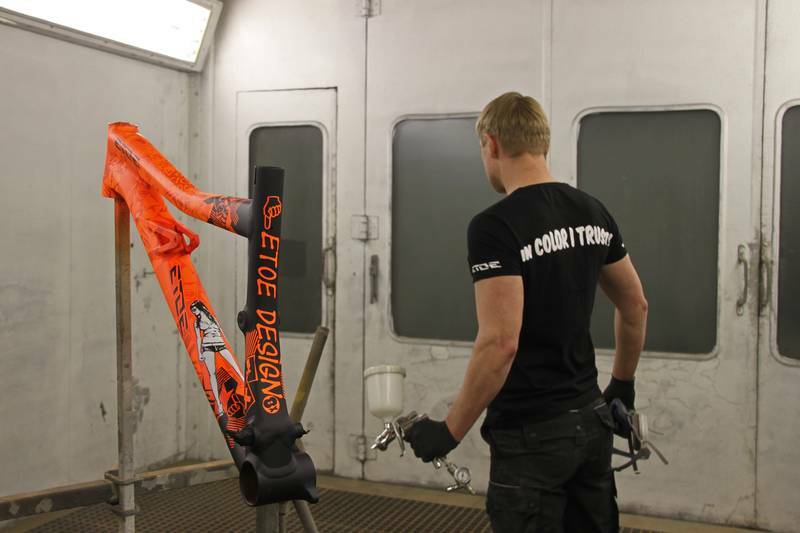 The video shows how Martin Grey sprays the design on the frame. 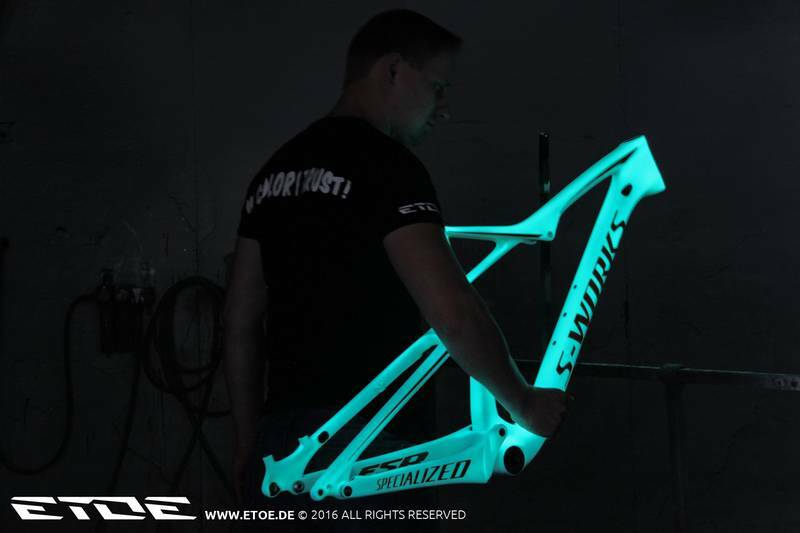 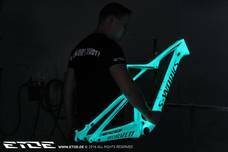 Glowing special paint scheme on a Specialized Epic. 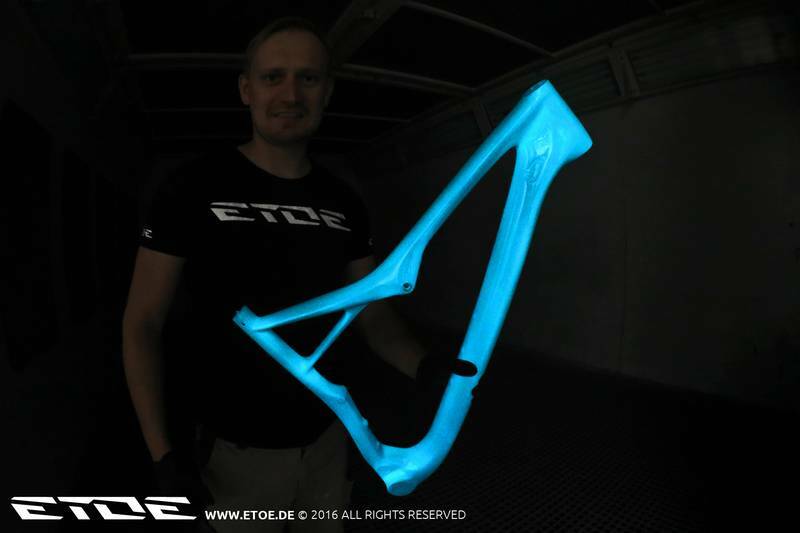 The ETOE glowinthedark paint scheme charges through sunlight and glows in the dark up to 30 minutes in virulent green blue. 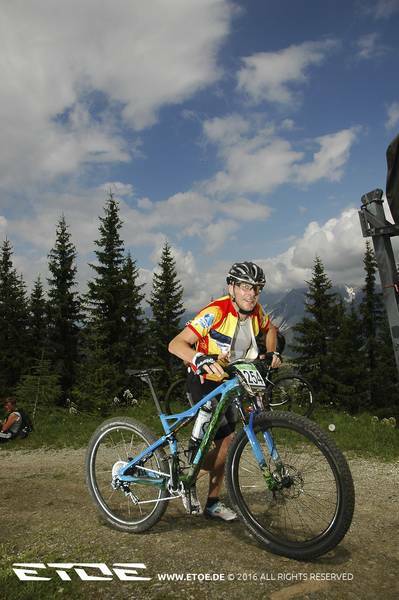 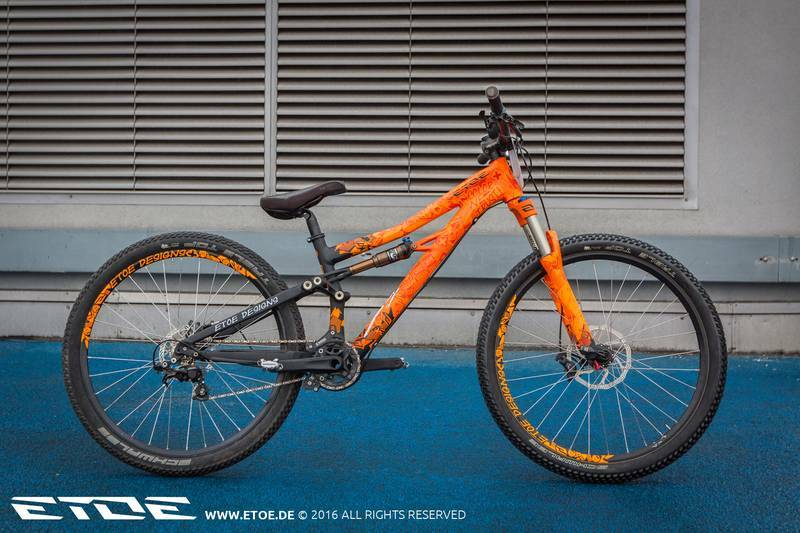 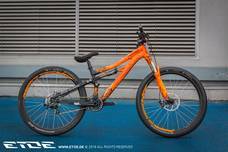 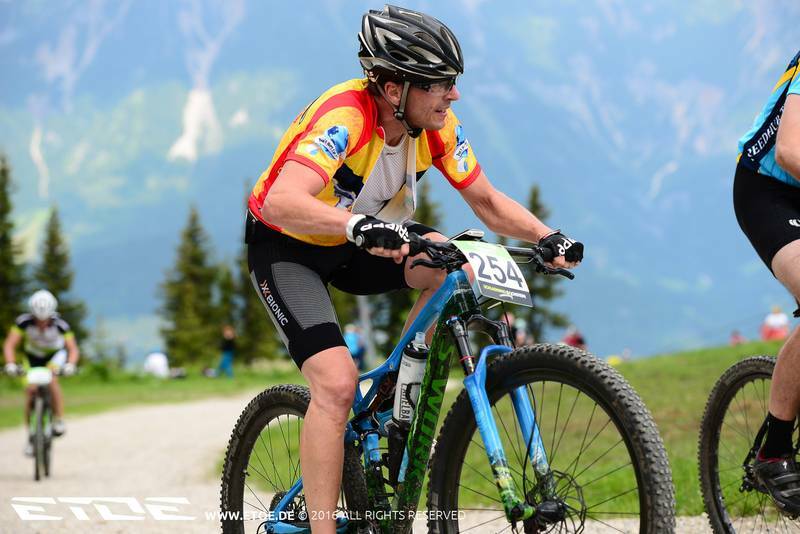 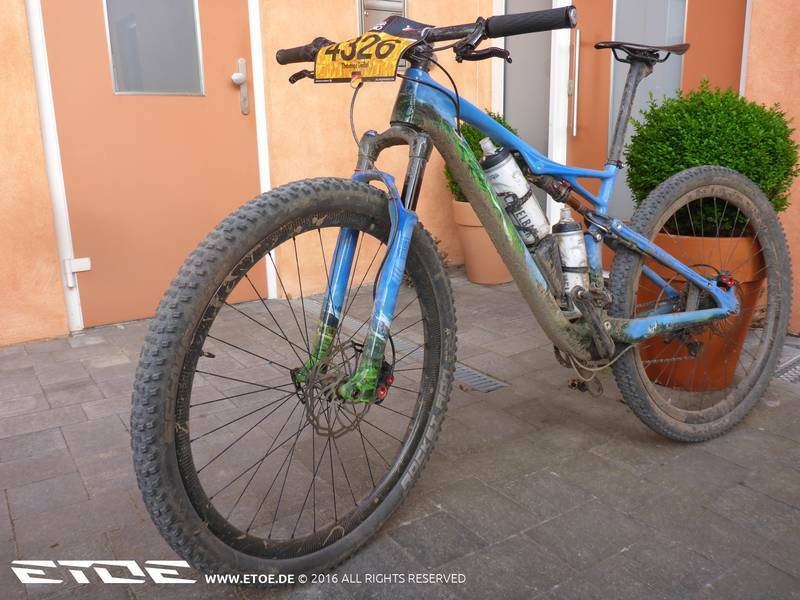 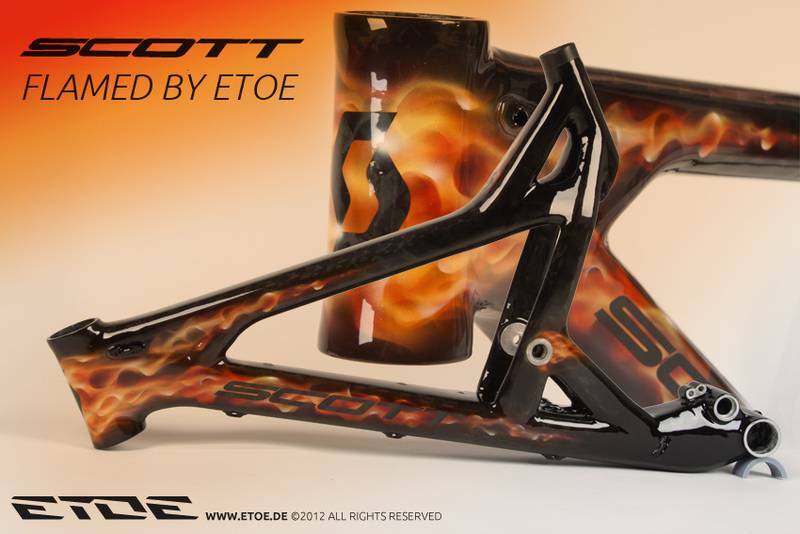 Erik Fickelscheer started with ain individually designed Specialized Enduro SX at the Downmall Tour. 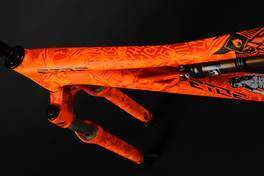 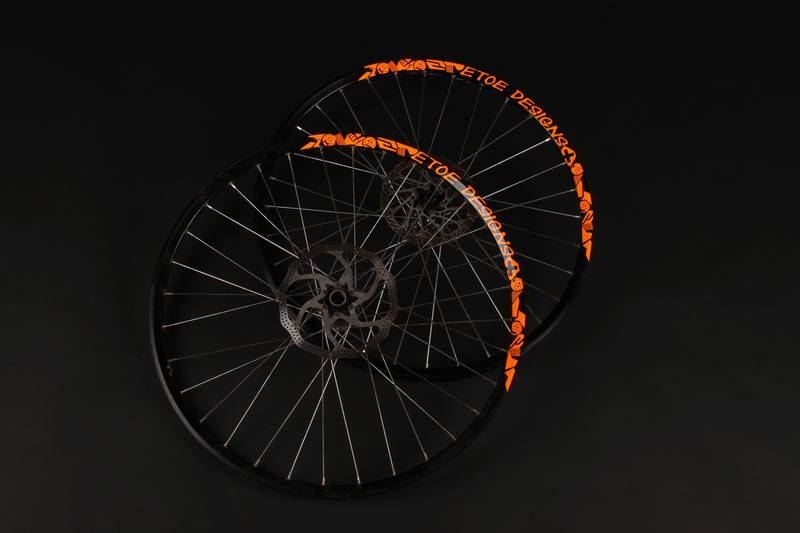 Martin Jahnecke drew up a flashy design in neon orange. 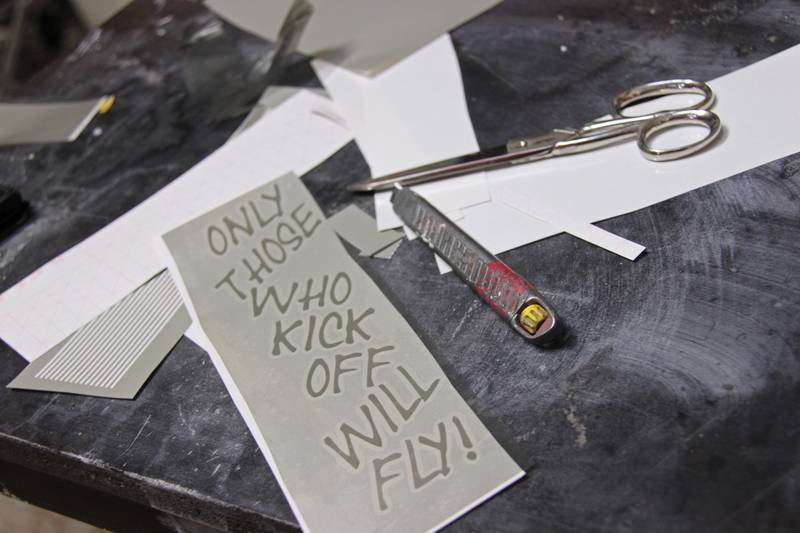 "Only those who kick off will fly!" 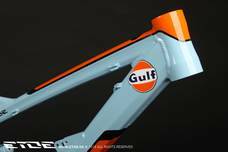 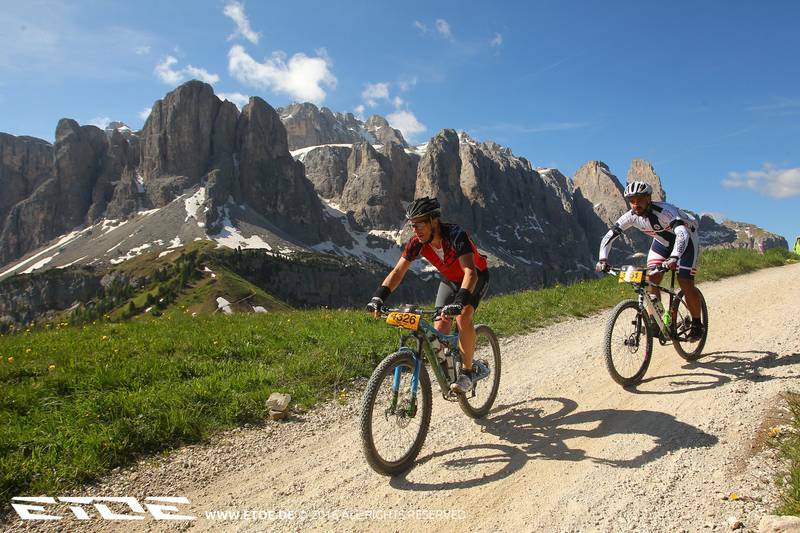 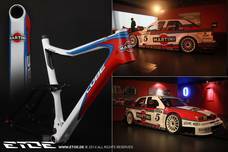 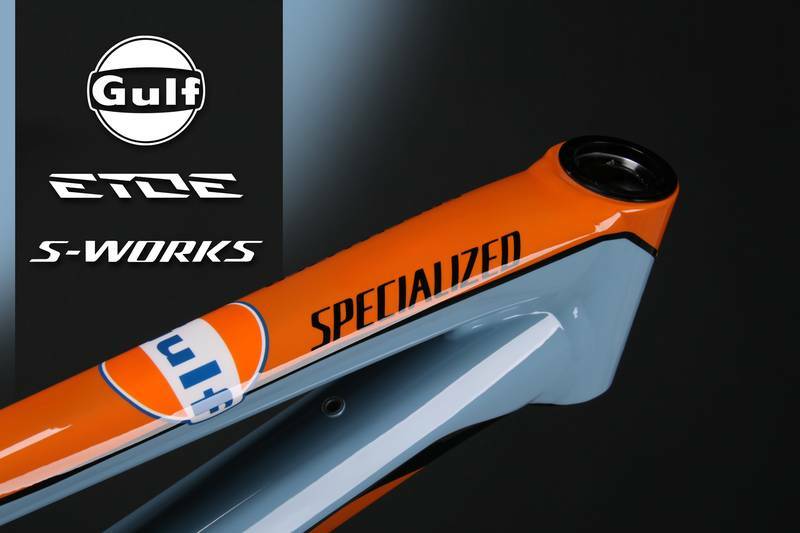 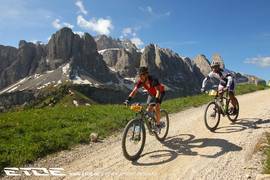 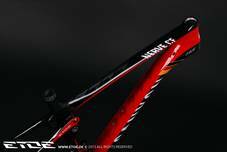 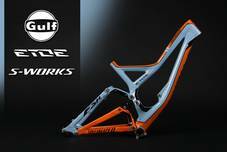 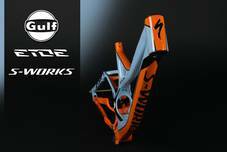 Specialized Enduro in Gulf Racing Design. 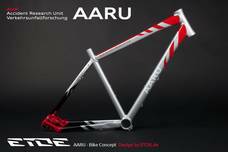 Martin Grey presents the development of the design on an aluminium frame. 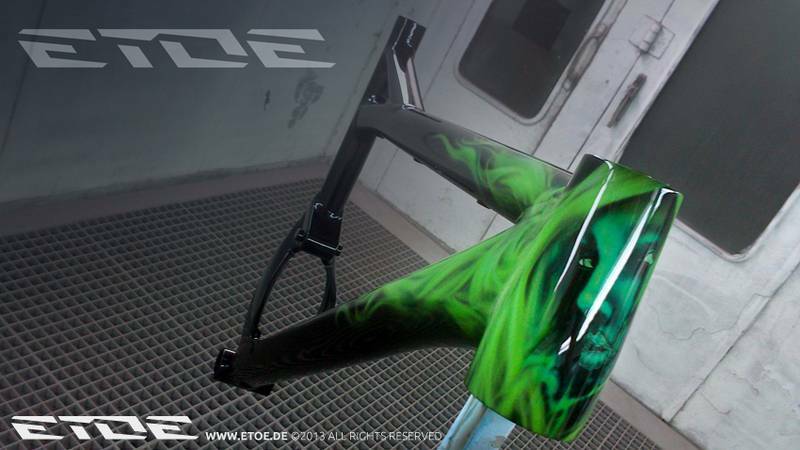 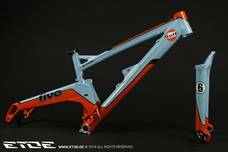 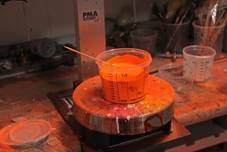 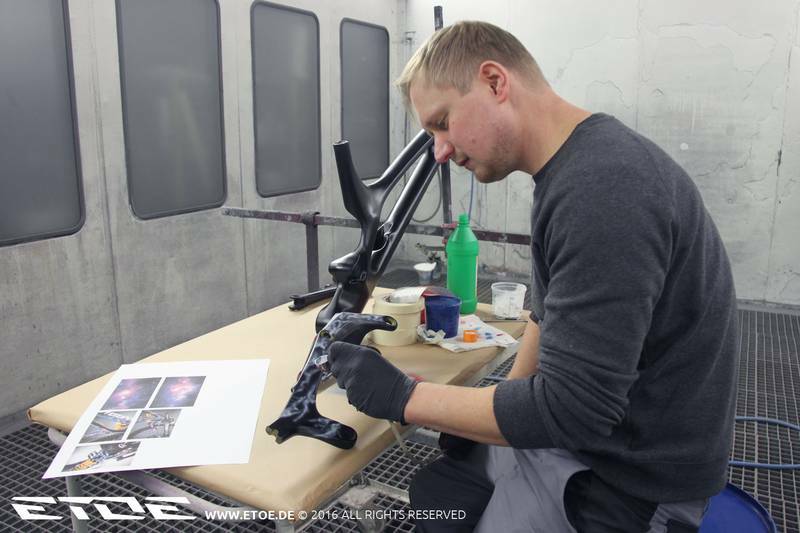 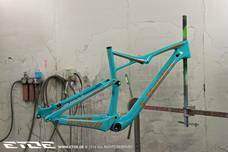 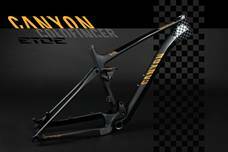 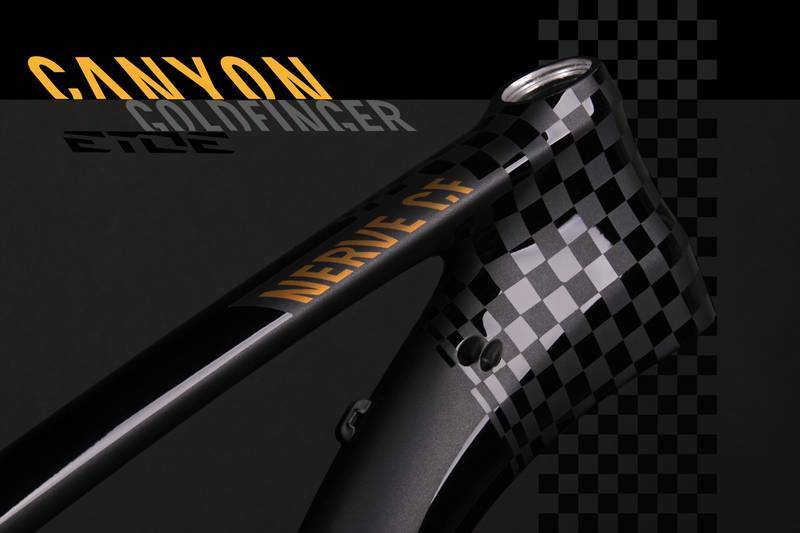 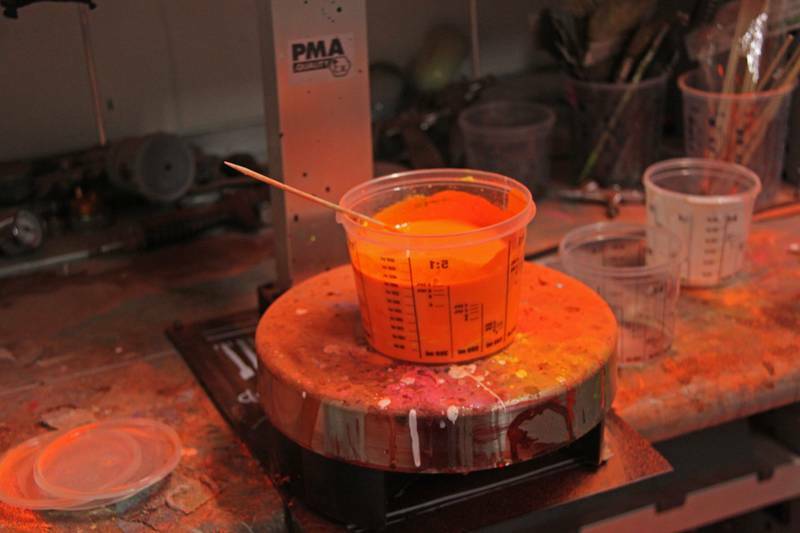 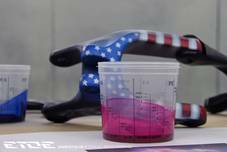 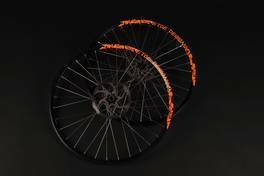 Suspension forks and fork castings can also be painted in a compatible design. 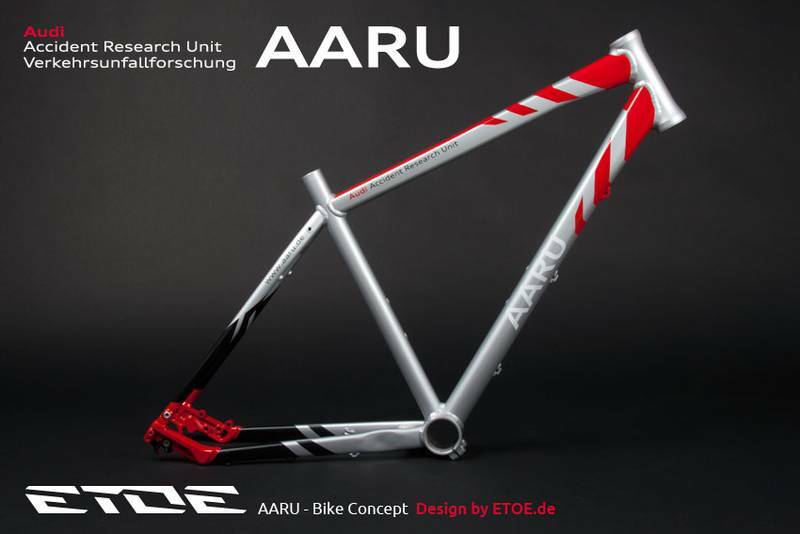 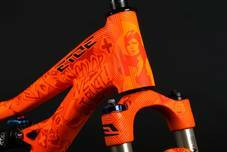 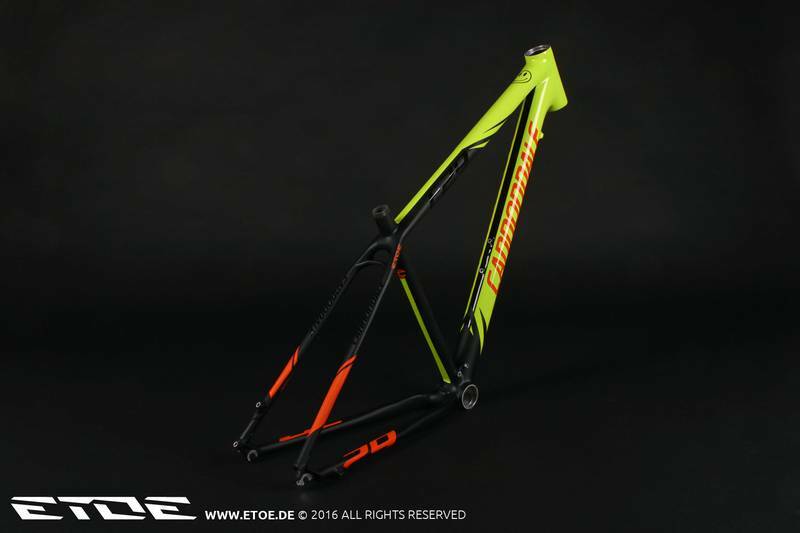 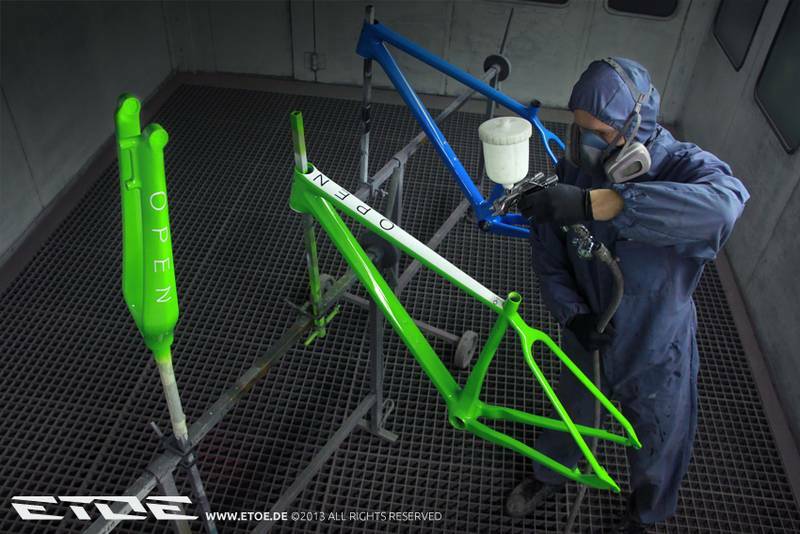 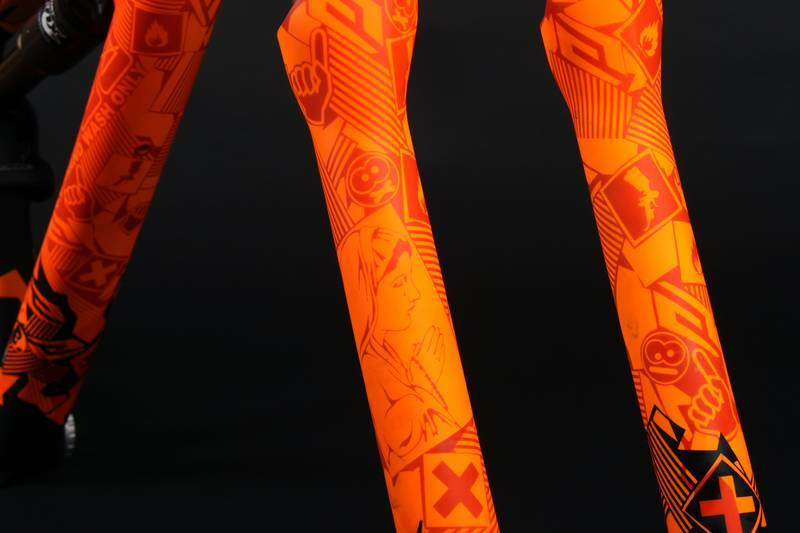 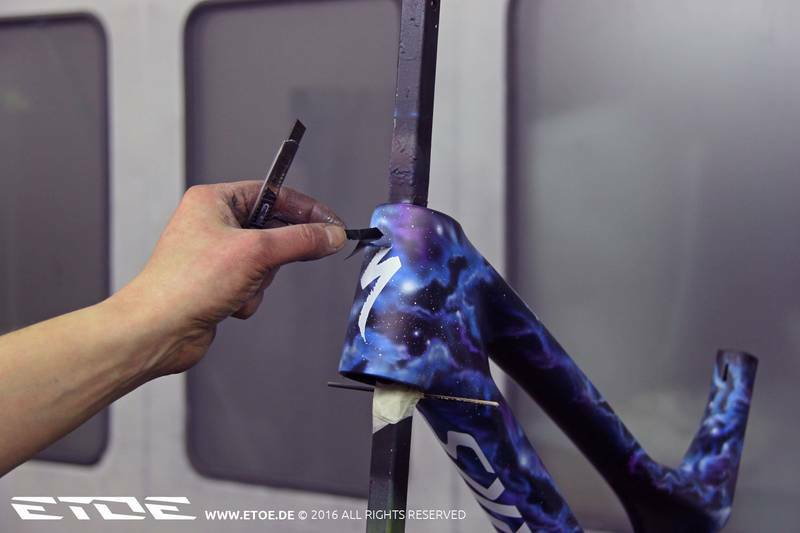 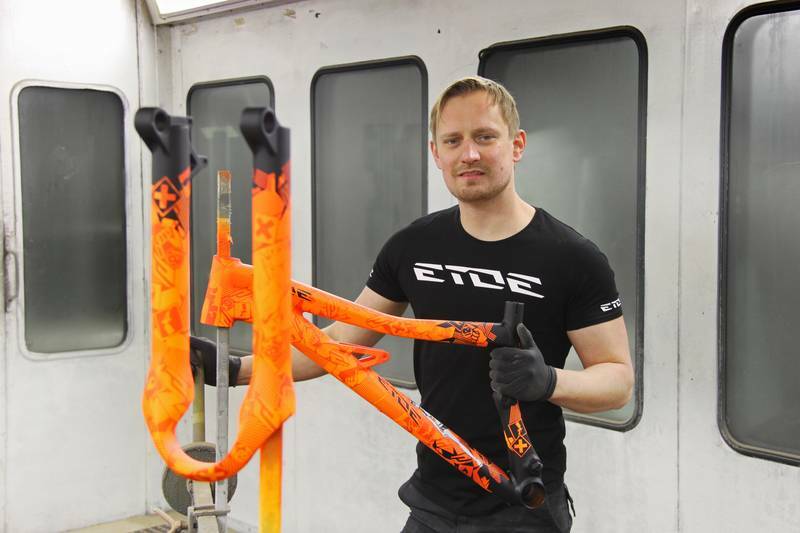 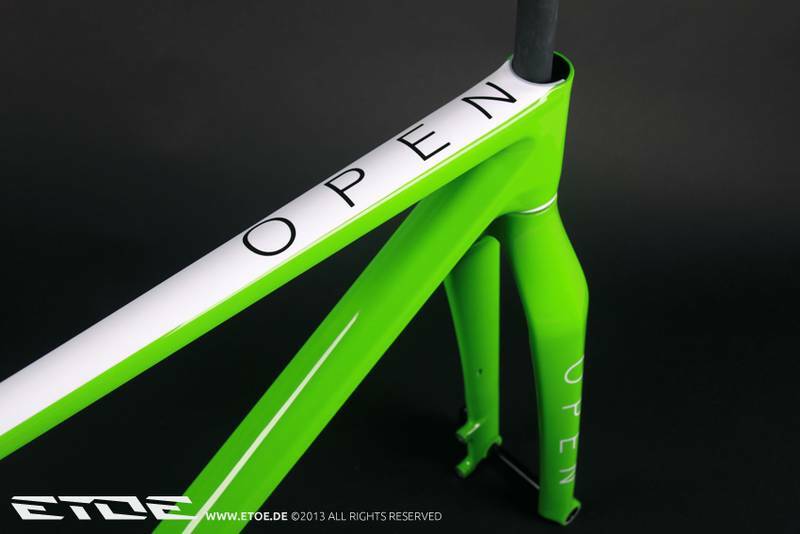 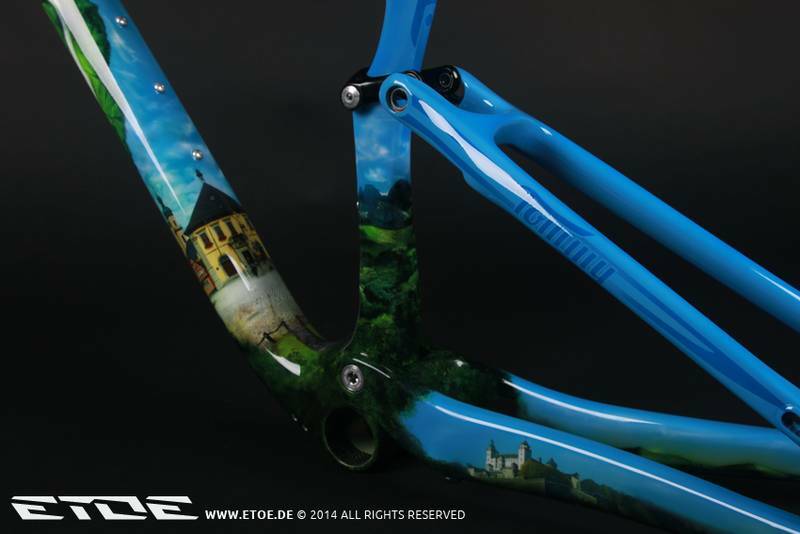 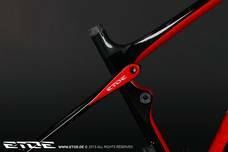 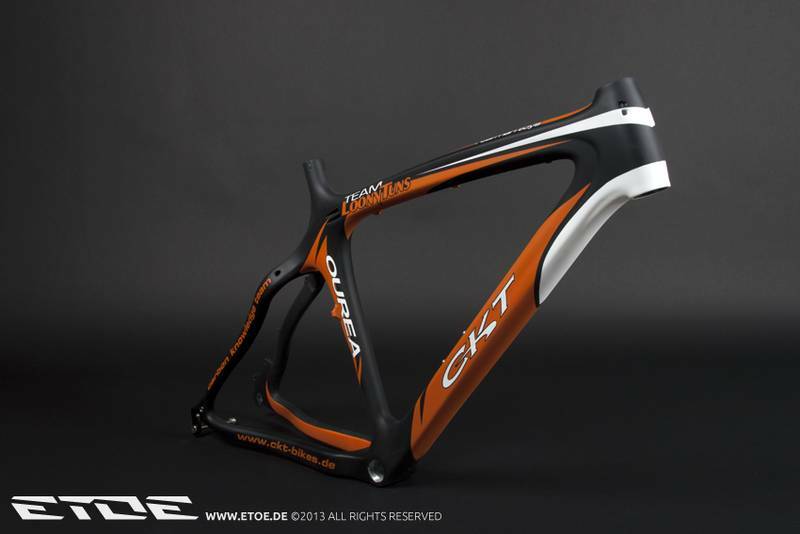 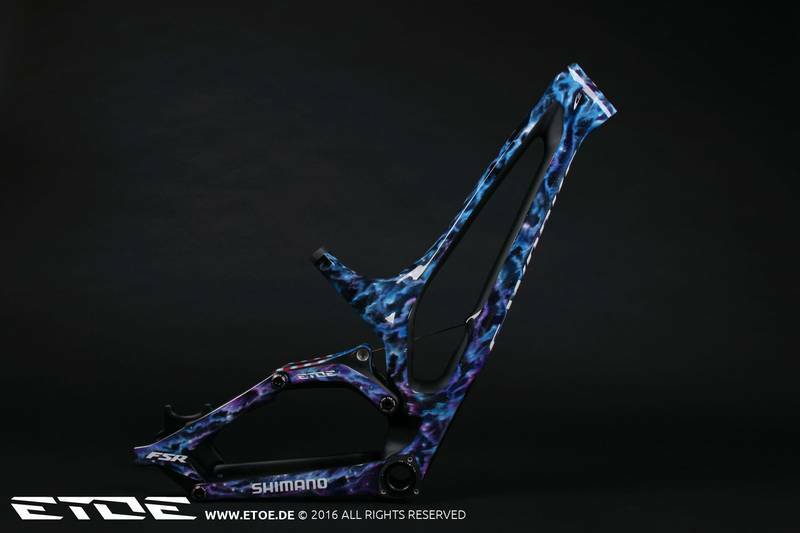 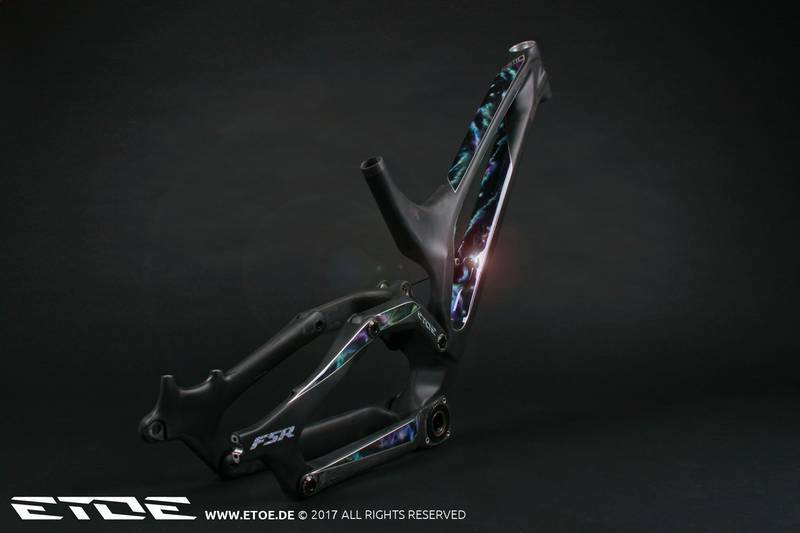 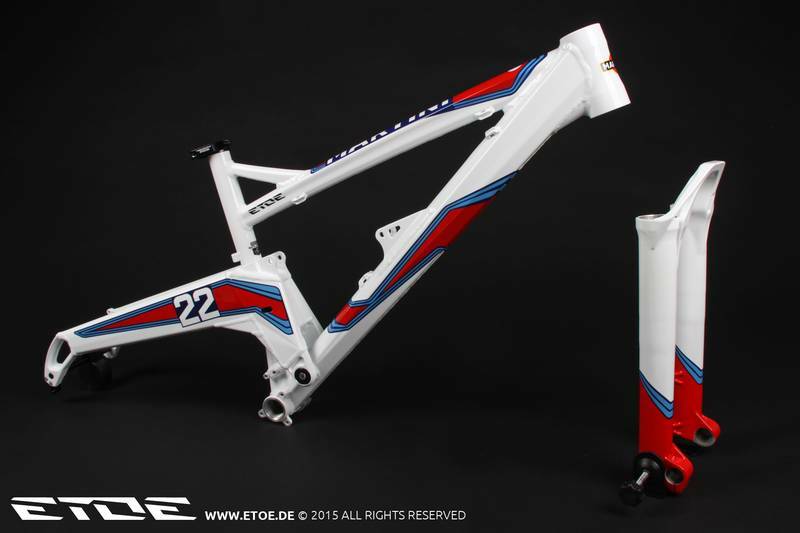 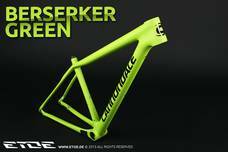 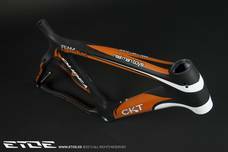 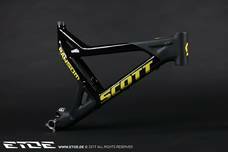 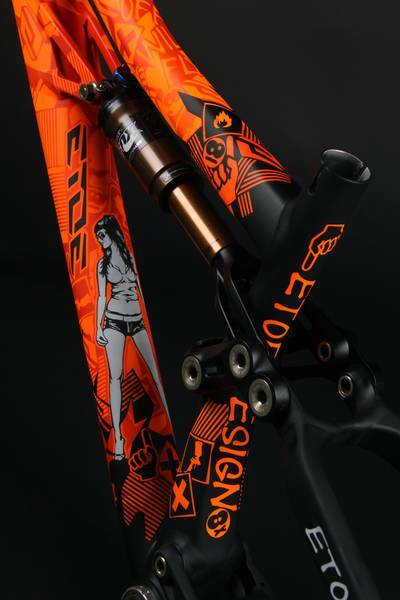 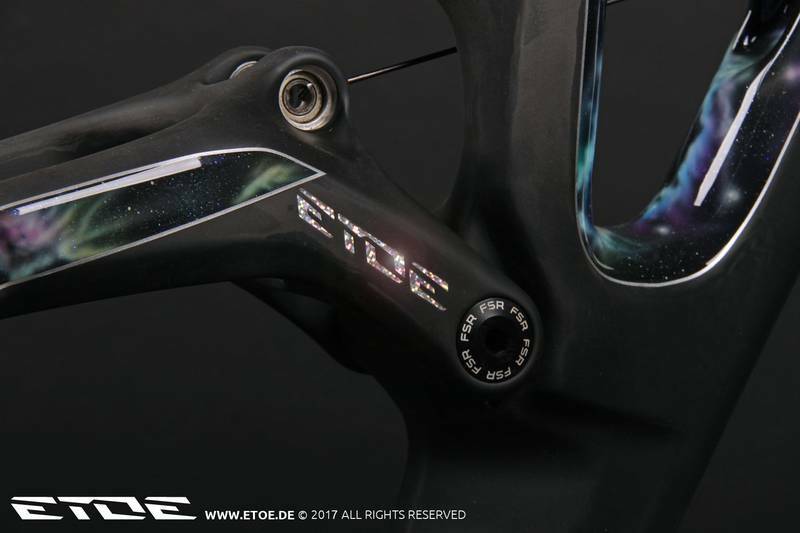 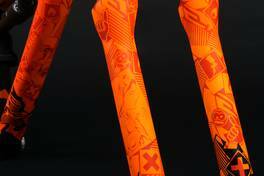 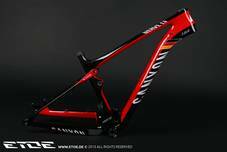 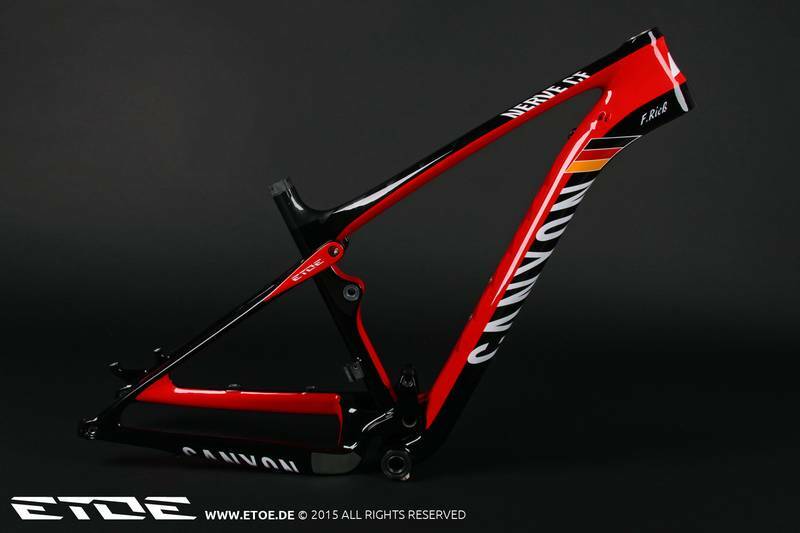 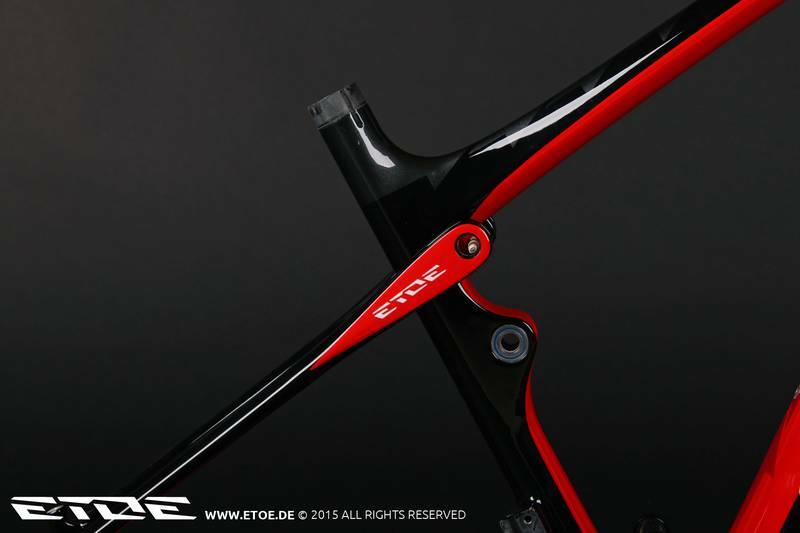 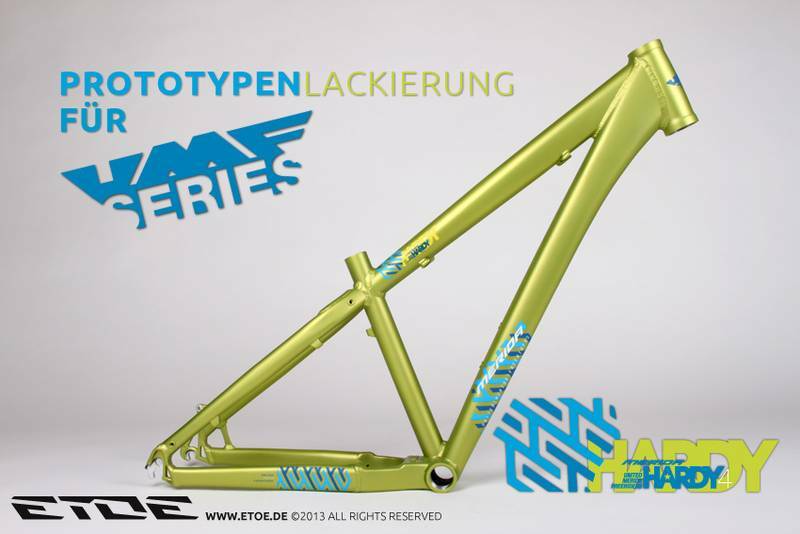 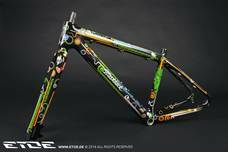 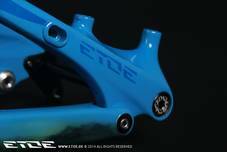 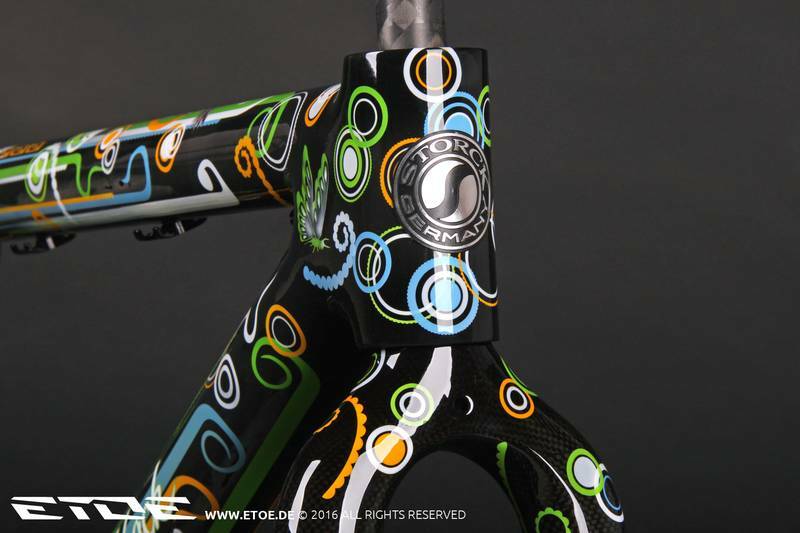 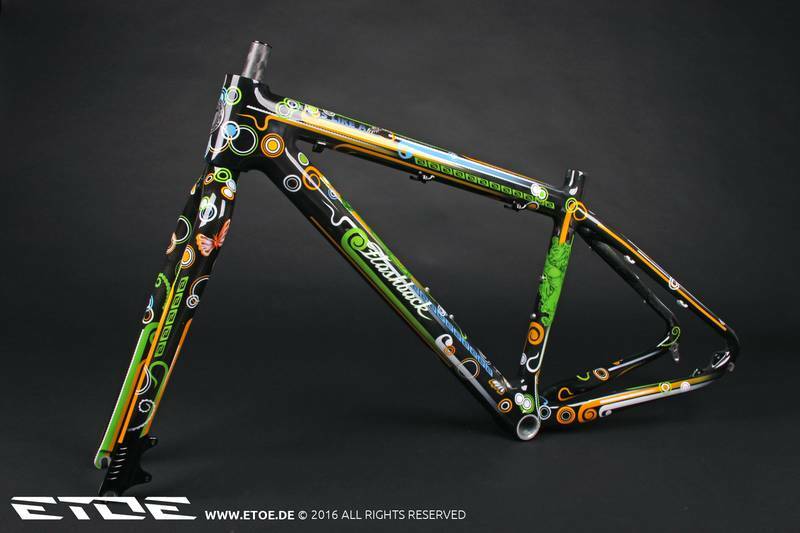 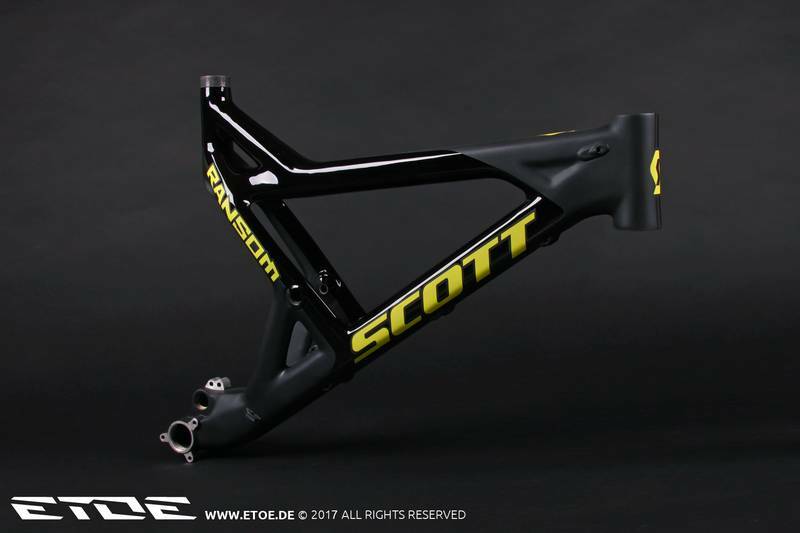 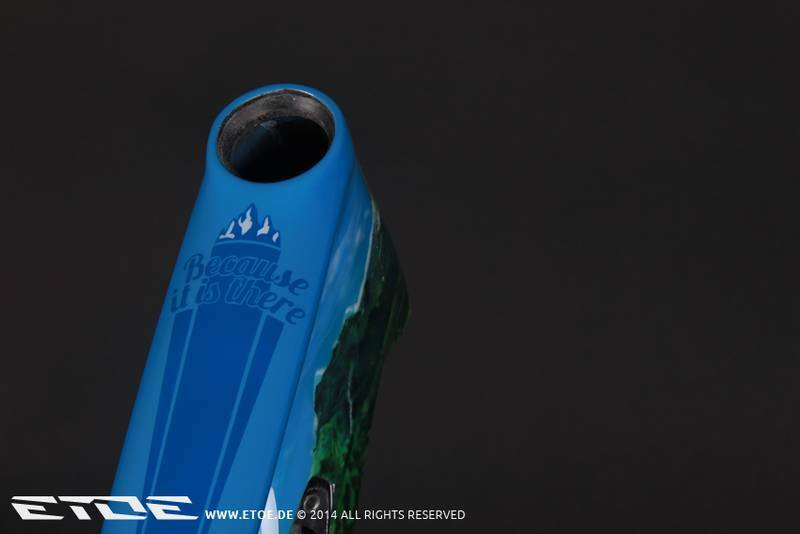 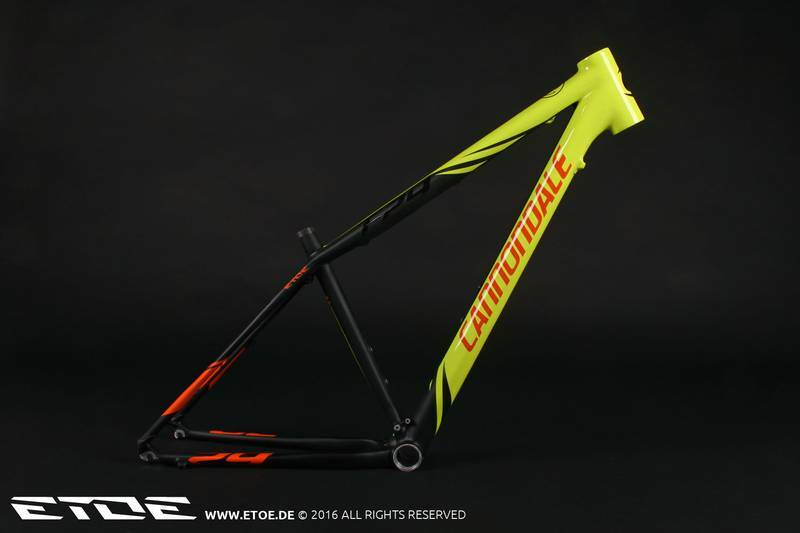 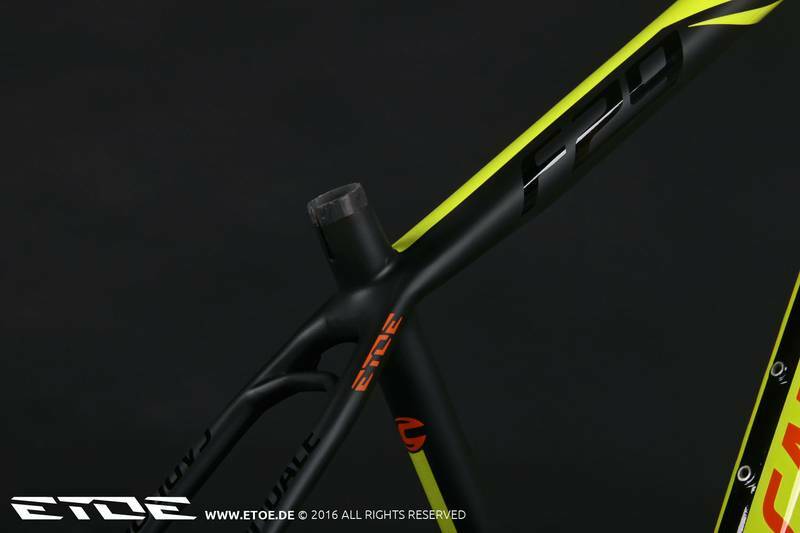 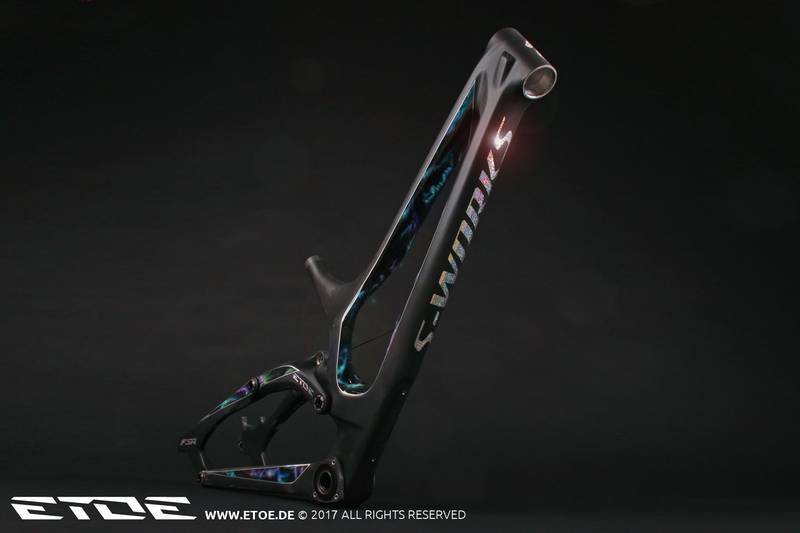 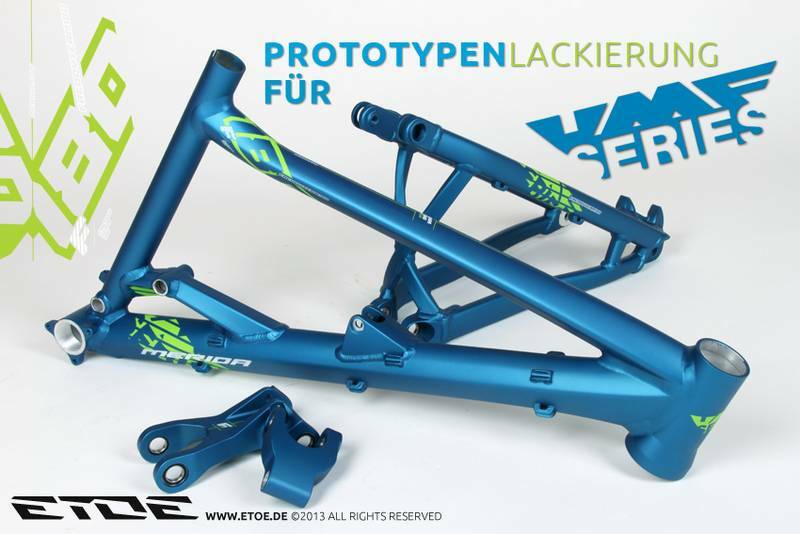 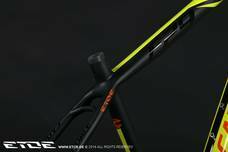 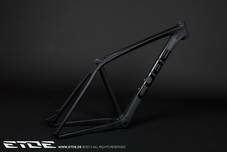 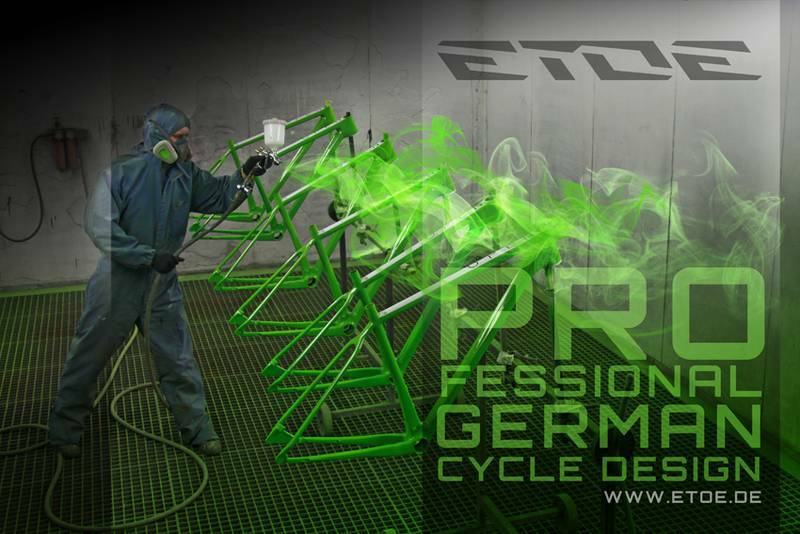 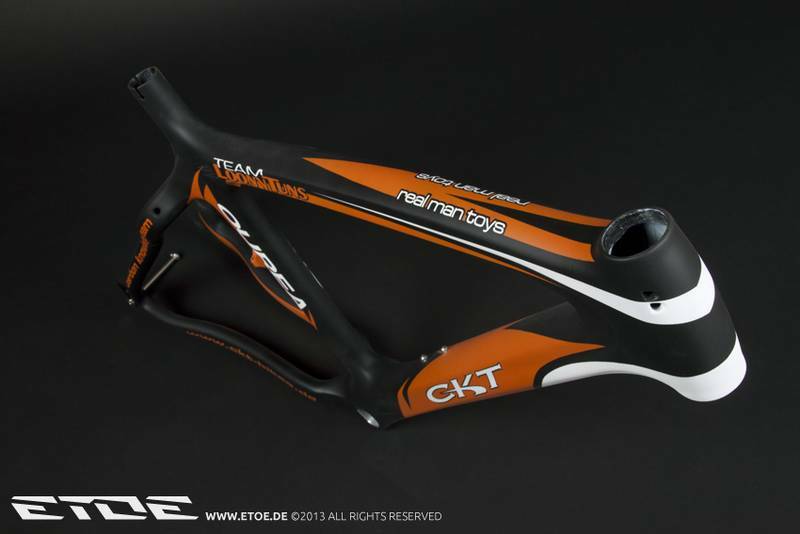 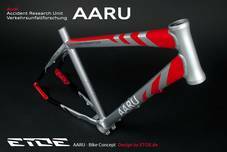 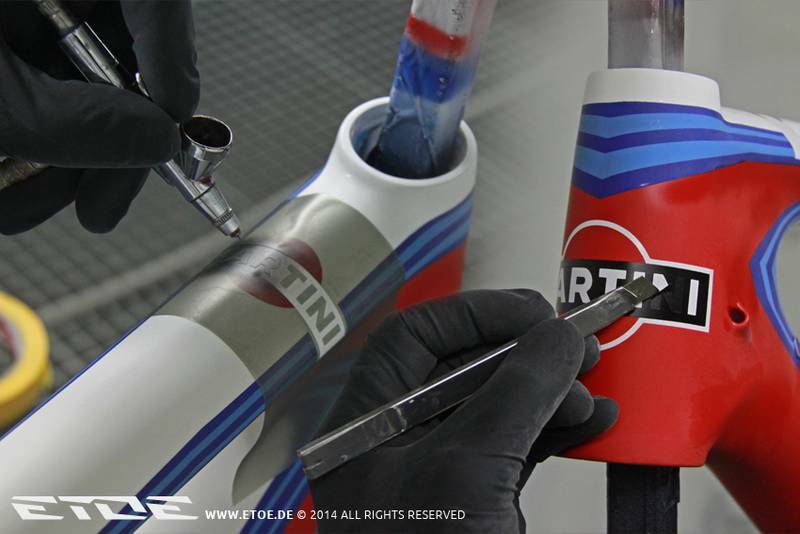 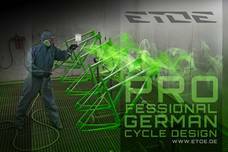 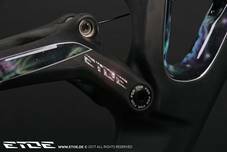 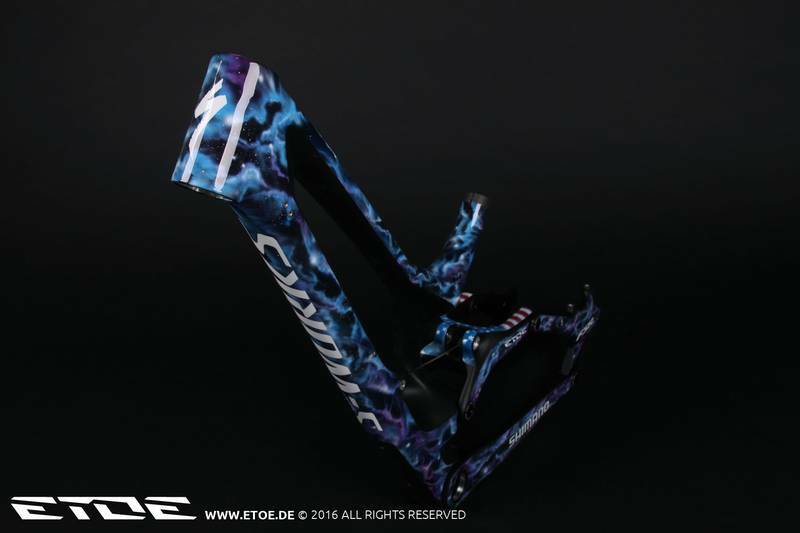 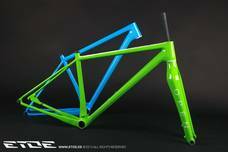 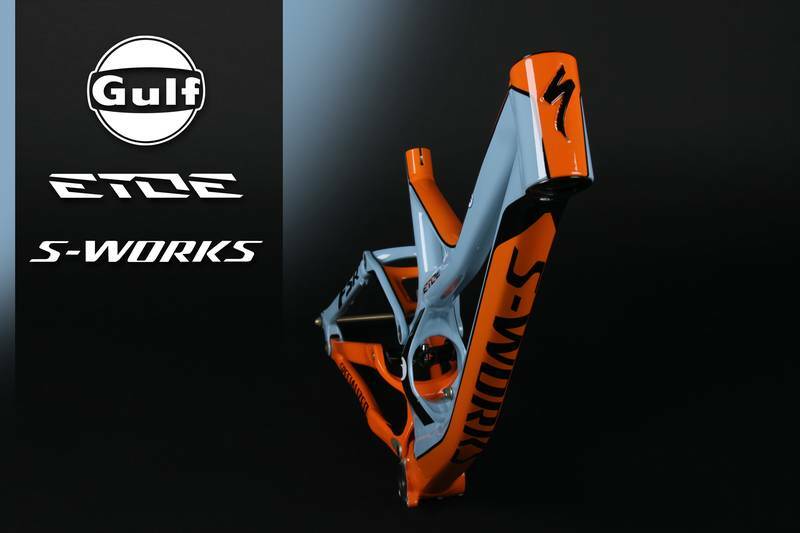 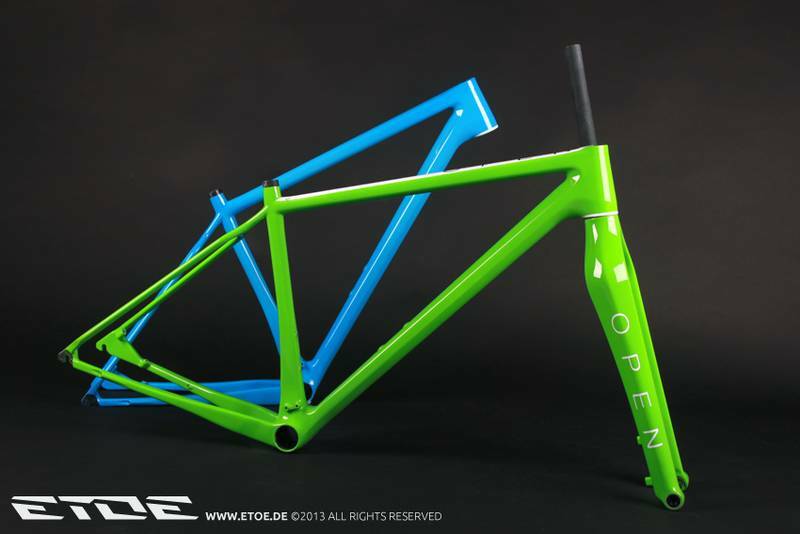 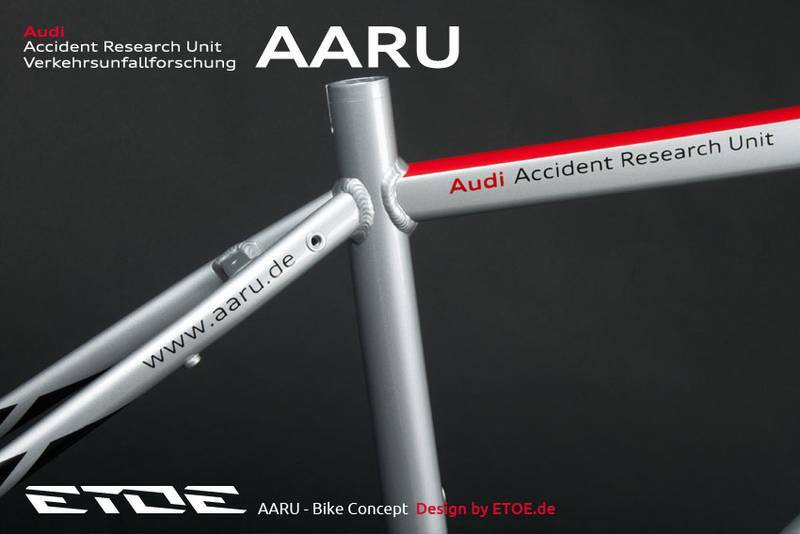 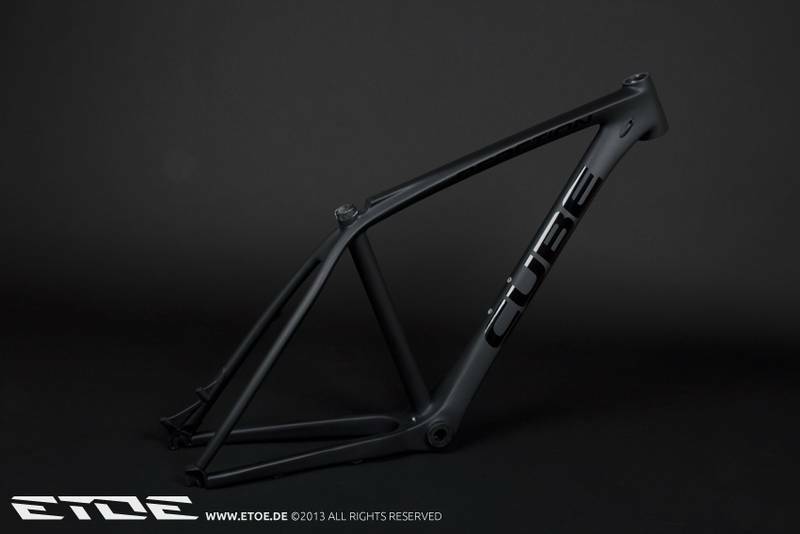 ETOE designs and paints premium carbon frames in special colors for the Swiss brand OPEN. 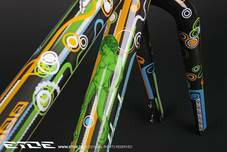 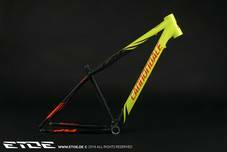 The frame is characterized by lightness and gaudy colors. 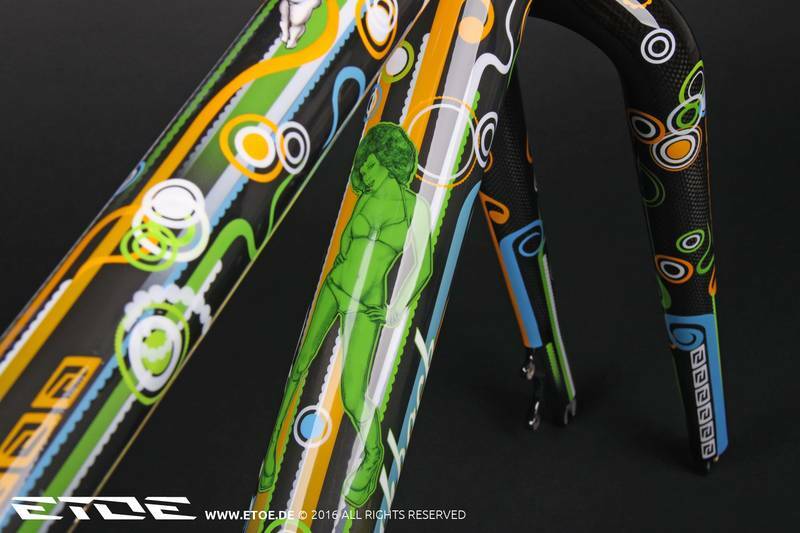 Despite the extravagant design the bike is ridden.